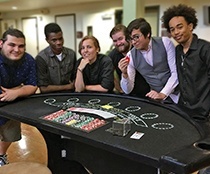 Monte Carlo Night gives Founder's Hall residents an opportunity to dress in fancy attire and take a chance on iconic games like Black Jack, Craps and Russian Roulette. No gambling required - or allowed, just fun and games with your classmates to take your mind off schoolwork for a bit. Founder's Hall frequently offers a variety of extra-curricular activities to engage students' interests. Use your skills to your advantage! That's what UAT Digital Video students enrolled in the Cinematography course like to do. With encouragement from their professor, they can omit a written test if they decide to film their final exam instead. One who does not know the process of creating a short film may think this is the easier of the two options, but that is simply not the case. In order to film the final, DV students will utilize skills they learned over the semester such as color grading, capturing sound effects, smooth and steady camera movement, and digital storytelling as they bring the tale to life. Filming your final also gives the student more practice in their craft of digital filmmaking versus writing a lengthy paper and the film is an asset to show future employers as the paper will not have much use after the class has ended. For a young adult with autism, the college experience can seem like a scary encounter instead of an opportunity to learn amazing things. To help provide a less intimidating bridge from high school to college, Southwest Autism Resource & Research Center (SARRC), New Way Academy and UAT partner together each summer to hold a weeklong summer camp for individuals age 16 to 26 with autism spectrum disorder (ASD). This college summer tech camp helps these students navigate through the social aspect of attending classes, living in the dorms, eating at the campus cafe, participating in activities and more. It's possible that many of these students would not feel comfortable enrolling in college but this camp helps illustrate that UAT has the perfect culture and environment to nurture students with all types of learning styles. With a chunk of clay in hand, a game artist's imagination can run wild. The Sculpting class offered for UAT Game Studios artists gives students practice in character creation by allowing the artist to determine the look, shape and feel of the asset with their hands. Students use skills they have learned throughout the Game Art and Animation curriculum such as texturing, perspectives, dimensioning and more to create a realistic character with physically accurate biology. This project is helpful in illustrating how a character would interact within a video game world giving the artist a insight on ways to make future games more interactive, fun and realistic. Opportunities in Cyber Security heat up during the summer with well-known industry events like Black Hat and DEF CON! Each summer, UAT Cyber Security students can apply to work as paid volunteers at the iconic Black Hat Briefings in Las Vegas. No, they aren't there to party! At Black Hat, they gain industry experience in setting up networks, WiFi connections, routers, switches, and much more. This internship alone can open so many doors for students looking to network and break into the industry upon graduation. The day after Black Hat ends, DEF CON begins and many students stick around to attend or work at DEF CON, as well. Occasionally some lucky students who showed promise at Black Hat have been asked to work as DEF CON Goons, aka security, which is an honored privilege. DEF CON is full of hacking activities like Capture the Flag (CTF), Pentesting, and the Lock Picking Village as well as vendors and companies from all aspects of the Cyber Security world. While at Black Hat or DEF CON, students may find solid job opportunities by simply immersing themselves in the industry and networking with professionals in the field. Don't miss out! Students, you have 48 hours. The mission is to include one specific prop and one required line of dialog in your film. Now, go make a movie! UAT Digital Video students are up for the challenge! They've had lots of practice competing in the Inter-College 48-Hour Film Challenge as UAT hosts the event each spring trading off with Grand Canyon University (GCU) to host in the fall. As you can imagine, the rivalry is strong with these two schools as students brainstorm the most creative, outstanding film concepts to bring to the table at each competition. The friendly competition inspires students to bring their A-game as well as to be organized and communicate effectively among the film crew. At the spring 2017 event, UAT Digital Video students entered two teams to compete against GCU's five teams taking home awards for Best Technical and Best Film. If you have a passion for filmmaking, consider a degree in Digital Video at UAT and this could be you! The life of a UAT student revolves around classes, projects, internships, jobs and friends, all of which are important aspects of a well-rounded college experience. Since students stay so busy, it makes fun events and clubs like Nerf Warz all the more enjoyable. UAT students and alumni jump at the chance to run around campus with plastic Nerf guns shooting soft darts at each other in a childlike war game fashion. Nerf Warz is like playing a video game in real life without needing extra lives to play on. Nerf Warz is also a great way to get to know your classmates and the campus from all angles - which makes this club activity a perfect icebreaker for new students who attend the UAT Experience (UATX) tour and overnight event. See the campus for yourself at UATX, which happens five times per year at UAT. Cyber Security alumni have created a startup company for penetration testing called AntiMatter Security, LLC. The team consists of William Peterson (Network Security, Technology Forensics), Stephen Chicosky (Network Security, Network Engineering), Kenny Welch (Network Security), Roger Brambila (Network Security, Advancing Computer Science) and Roger Allen (Network Security, Advancing Computer Science) all who earned their degrees from UAT. These students have been to Black Hat Briefings as paid volunteers in the past. This year, they will return to the conference as trainers teaching two 2-day classes they developed called "Attacks Over GSM With Project Mayhem." Participants will immerse themselves in the world of hacking while learning new attack techniques to help defend networks. They will also learn to combine Red Team and Pen-tester prowess to create a less common attack tool, a device that participants will build at the training and can take home with them. With the new Project Mayhem Kit, it's easier to think like a hacker thinks, engaging in a live environment with an innovative attack tool that you will build and deploy. In this completely hands-on training, you will demonstrate your new abilities to hack air-gapped systems and bypass perimeter defenses over a GSM network. A lot of credible information will be disseminated at the training including the following topics: Configuring Mayhem Kit, Basic Scripting Logic, Windows Exploitation, Linux Exploitation, Bypassing Perimeter Defense Systems, Social Engineering Concepts, Covert Concealment and Placement Techniques, Red Team Activity, Data Extraction, Isolating and Exploiting the Target and more. The training sessions are already sold out. More information on the class can be found here. You can also purchase a cool baseball hat to support Antimatter Security. 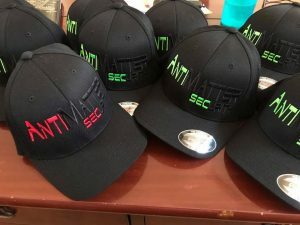 Antimatter Security, LLC swag for sale. Get yours today! Help spread the word. Like Antimatter Security on Facebook! On this calm, sunny day at UAT, Digital Video students are using this time to practice take-off and landing... of what you might ask. Well, today, they are piloting a drone! 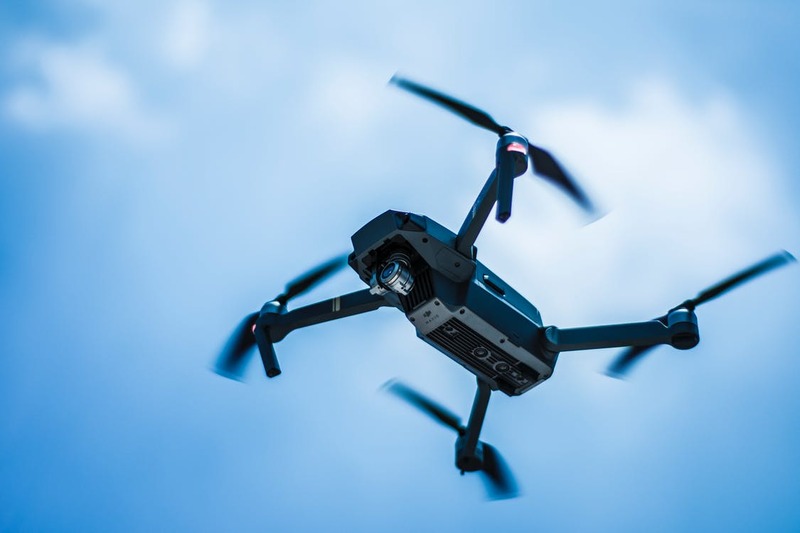 Film students utilize a range of technology including drones affixed with cameras and microphones in order capture the desired footage to tell their story. A drone can assist in filming aerial shots on set which can be impossible to create without an aerodynamic device capable of flight. At UAT, it's common to see student film crews with fancy camera equipment like drones working in groups on campus to create a short film. After the film has gone through post-production, faculty and staff are amazed to see how students transform ordinary spaces around UAT into their ideal set making them almost unrecognizable as to what came before. Aim high! Having access to industry standard equipment gives UAT students real-world practice while in college to help them master these technologies to become seasoned filmmakers. Get your hands on a drone today! Not afraid to get involved, ask questions and engage with topics in other disciplines, Daniel is a brand-new student at UAT, studying Game Art and Animation. His professors have noticed that Daniel stands out for being conscientious and creative within the mere months that he’s been with us. Daniel appreciates the intimate setting that UAT provides where he can casually meet with tutors, mentors and professors for help in the Commons. Daniel has been earning top marks in class, but still finds time for fun, personal projects like a cool “prop space blaster,” where he gets to let his creativity take over! The sky is not the limit when technology is the medium! Let your passion lead you out of this world like Daniel and his prop space blaster! Lyndsey’s passion for technology led her to UAT from her hometown in Rogers, Minnesota. As a game designer, she’s been diving headfirst into projects, collaborating in teams and letting her innovative ideas run wild. With access to the best resources in game development at UAT, Lyndsey is perfecting her skills and considering adding a second major in game programming to her arsenal in order to reach her dreams of landing a career in level design or narrative design in the future. Lyndsey also pitched an idea for a cool restaurant concept called "Pizza Sweetza" in Professor Mark Smith’s Business Technology class and won a 3d printed Mark Tank trophy! The phrase “can’t stop, won’t stop” comes to mind as Lindsey continues to absorb all the game dev knowledge she possibly can. This broadness of the assignment allows for creativity, innovation and technology to intersect, enabling students to develop a range of neat projects. Winning the Provost Challenge helped to spark Konrad’s enthusiasm for UAT, as he realized that passion for technology oozes from all corners of the building. He found his calling, the place where he can develop his skills and prepare for his dream career as an art lead for a major game company. Keep an eye on Konrad in the future! UAT is a tremendous advocate for encouraging local youngsters - male and female to get immersed in the world of technology. Code Day, put on by Startup AZ Foundation, is instrumental in furthering that mission by gathering students ages 9-20 in underserved populations and areas with limited technical resources together at UAT with extensive access to tech for this 24-hour hacking event. The goal of Code Day is to offer a fun event where students can digest and learn coding skills in hopes to expose young tech lovers to career possibilities in the world of programming and information technology. Don't know how to code yet? That's okay! Students with all skill levels are welcome to participate and learn along the way. Code Day offers workshops and mentors to offer helpful advice throughout the hackathon. 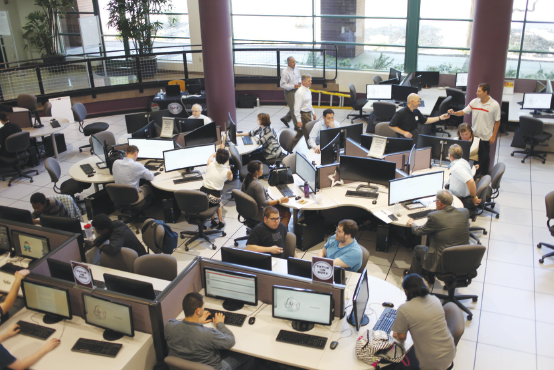 UAT is proud to regularly host Code Day Phoenix, working towards making Arizona a technology hub for the future. In celebration of UAT's Founding Day, faculty and staff take the day off, but that doesn’t mean students are just sitting around the tech-infused campus bored... no way! As a tradition, the UAT Game Studios department hosts a 48-hour game jam on Sept. 23, in honor of UAT’s Founder’s Day. What is a game jam, you ask? A game jam is a dedicated game development event lasting 48 hours, that gives game developers including designers, programmers and artists the opportunity to work together to build a complete game. No, it’s not required for students to partake in the game jam, but there are some great reasons to do so such as the opportunity to improve on your skills, meet new developers, utilize quick decision making and problem solving, as well as have a complete game build to add to your portfolio to show future, potential employers. Game Jam’s may take a lot of work, but for a game developer who’s looking to break into the industry, the payoff is big! 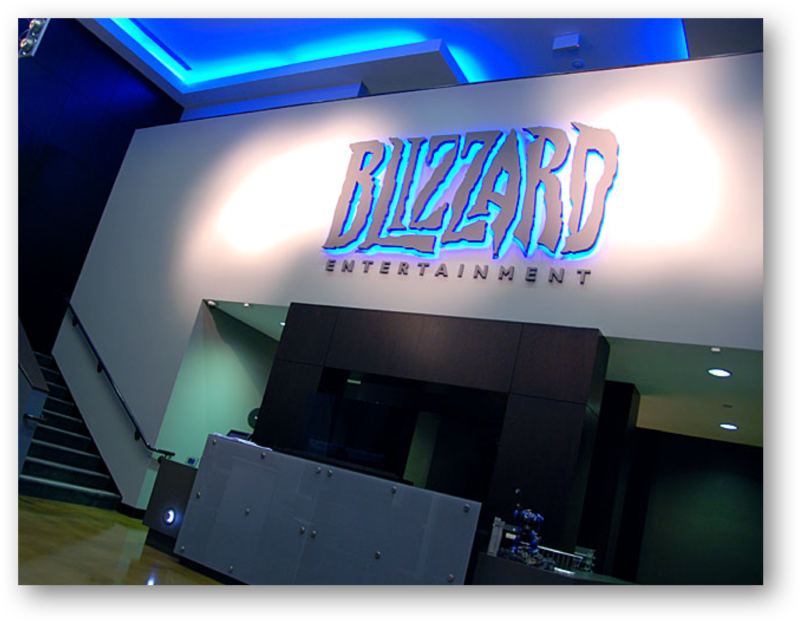 Employers like Blizzard Entertainment and Bungie want to see that applicants went above and beyond their assigned classwork and invested extra time into themselves and their skills. If developing video games for industry is what you want in your future, don’t miss out on game jam’s held at UAT throughout the year. A huge highlight of the summer for UAT students and faculty alike is the epic Phoenix Comic Fest, known for swarming the downtown Phoenix Convention Center for 4 awesome days of Sci-Fi, super hero and comic book shenanigans! UAT added value to Comic Fest (formerly Phoenix Comic Con) by offering advice from Program Champion Derric Clark, who spoke on a panel on Game Development along with other local experts. UAT Game Studios students and alumni also featured their indie games at the Southwest Video Game Showcase on platforms such as the HTC Vive, Samsung VR and Google Cardboard, as well as PC and mobile. Comic Fest attendees had the opportunity to play Escape Room VR, a game designed for an external client by alumni Waden Kane Studios. Other UAT games featured were Morpheus, which was a UAT Game Studios build and Wizards 1984 VR created by alumni Terrasect Mobile, LLC. Students let their creativity run wild as many drew inspiration from their favorite film or video game to dress up in cosplay for the day, some even had multiple cosplays to choose from, a different character for each day! As lovers of all things geeks, the student body at UAT can’t wait for the Phoenix Comic Fest to return in May 2018! Alumni Erin Ali graduated from UAT in 2007 with a Multimedia Degree. Today she has a career as an Online/Social Producer at Monolith Productions working on “Middle-earth: Shadow of War,” the sequel to Middle-earth: Shadow of Mordor. Her job duties include running schedule and production for the Online and Business Development Team. At a high-level her job encompasses all server-driven features, working with the game publisher and multiple external teams for platform and BI support and building/driving the post-ship live plan with Marketing and Community. Because Erin studied Multimedia classes at UAT, she got exposure to roles/disciplines in industry that were helpful as her current role as a Producer. The GAM101 course provided a view into the industry and being a student at a University that highly mirrored the male:female ratio in the industry, she had an idea of what her career could largely look like. 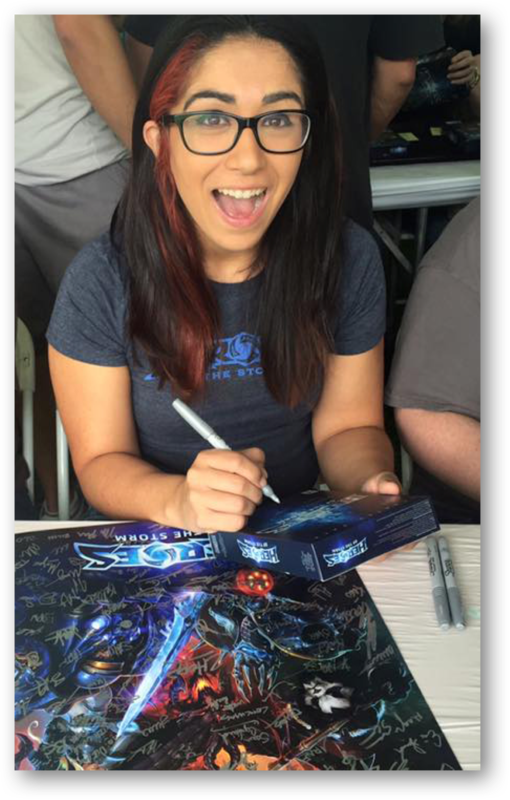 Did I mention that Erin began her career with Blizzard? Erin worked at Blizzard Entertainment for 7 years. How cool?! Get used to interviewing early on in your career. Ask for feedback and take constructive criticism from peers and authorities. Let your quality show in your work and personality. Get used to conversations being a two-way street. Feedback does not go away once you’re hired, you can always learn new ways to improve. Remember: Developers are people, too and want to help if they can. Approach them genuinely with an eagerness to learn. The person who gave Erin’s resume to a hiring manager at Blizzard was a guest lecturer she met at Tech Forum. You’re going to be okay, friend! 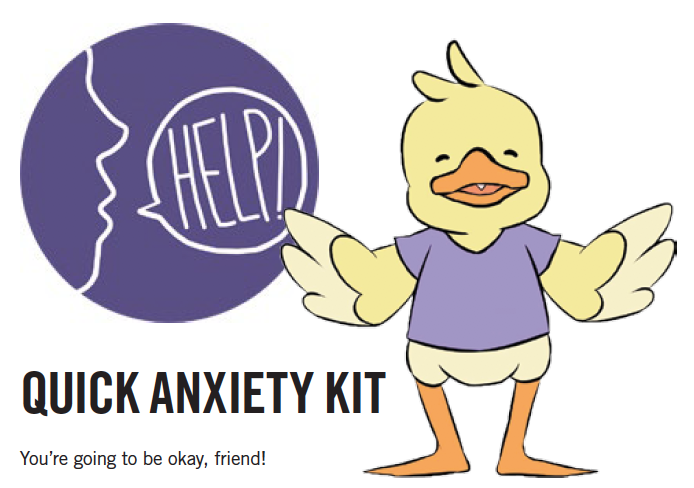 That’s the reassurance the Quick Anxiety Kit provides in this Student Innovation Project that can be a much-needed extended hand of support when anxiety occurs. It’s staggering! According to the Anxiety and Depression Association of America (ADAA), about 40 million people between the ages of 18-54 are affected with anxiety in the U.S. alone. Of those people, roughly only 10 percent will get the effective help that they need. Quick Anxiety Kit is an app, which can be downloaded for free to help people who experience anxiety or panic attacks by using artistic components shown to have calming effects. These components include the color scheme, pictures, videos and a mini-game. The app will track when the user typically feels anxious and give them a reminder that the app is there when they need it and applaud/encourage them when they have had their anxiety under control for some time. Tappy Cat is the game within the app, designed to replicate a type of psychotherapy, called EMDR, which is used primarily to help work slowly through the trauma with the guide of a therapist. It also works without the guide of the therapist by replicating rapid eye movement that occurs while sleeping, which can help calm the body and mind. A free, interactive user tracking feature also helps individuals and caregivers keep track of anxiety episodes and which options on the app they are using. Choose from five different options: the breathing app, EMDR game, music player, check the user statistics, and Change the Settings. One of the biggest projects at UAT right now is Help Falls, a student short horror film. The cast and crew are reaching new heights in Payson, Arizona on the set of this interactive student horror film where they filmed the opening sequence. Pictured here are Digital Video students Jordan Wippell, Killian Davies, Jake Turocy, Brandon Scott, Paul Lopez, Alex Beaver, Patrick Kebert and others. Payson is just two short hours from the technology University in the heart of the Phoenix metropolitan area. When finished, the unique short film will include six sub genres and not just one but 30 possible endings. Terror you choose. Lots of great settings in Arizona inspire students to cross-collaborate and develop new ideas in filmmaking and game design. Imagination can be very organic at UAT. No, really! New students work together to design race cars out of vegetables and race to see who built the fastest car! Don’t be fooled by the food. They’re learning quite a lot about the physics and aerodynamics involved, and cross-collaborating with a host of other academic degree programs that begins their preparation for the real world. Not to mention sparking a creative idea or two along the way. When you can take what’s existing and find a new way to express it, change it, and build it to create new solutions, that’s innovation. And that’s what UAT student Andrew Weisenberger (Robotics and Embedded Systems major) did. He took the classic video game concept Snake, where the player maneuvers a line that grows in length, and developed his Student Innovation Project as its base. These comprehensive student projects at UAT are a state school’s equivalent of a master’s thesis but are way more fun and end up being leading projects in each student’s portfolio when they graduate and enter the workforce. See some examples and learn more at uat.edu/sip. Students and professors gather in The Commons, the electrifying hub on the UAT campus. Whether they’re working or playing, they’re having a good time either way. UAT’s central Commons is outfitted with an abundance of computer workstations and an extensive technology infrastructure. Student and faculty learning and resource areas are designed to foster working in collegial groups, providing flexibility and much needed access to technology. An extensive library, social areas for students, the UAT Café, UAT student tutors and support staff are adjacent to enhance student life and collaborative learning. 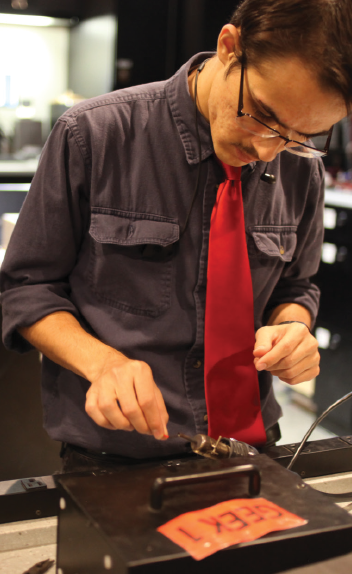 UAT student Garrett Tidd (Robotics and Embedded Systems) uses the heat shrink machine in the Robotics Lab to coat exposed cables to prevent the risk of being shocked. One of the many safety protocols and procedures in place to ensure the safety and security of all students, faculty and staff. Nothing is as important as the safety and security of all members of the UAT community.